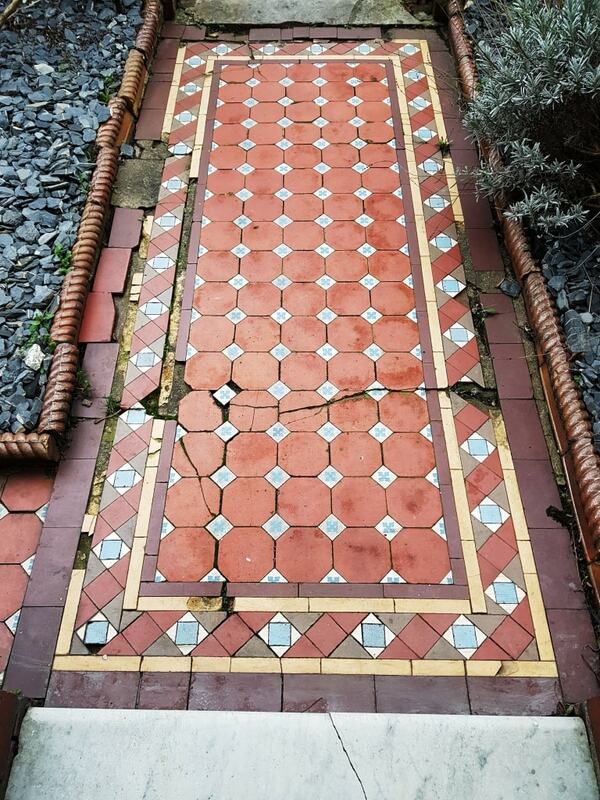 This Victorian tiled path leading up to a lovely period house in Cardiff was in a really bad state of repair with many damaged and cracked tiles. 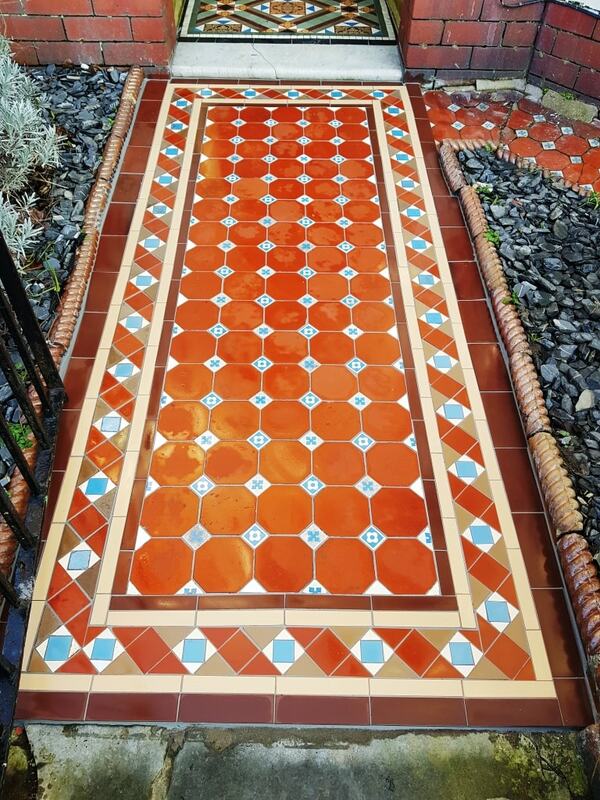 I had already been working on their hallway tiles and the customer was hoping I would be able to salvage the original tiles in the front path. I was confident something could be done but when I started to remove a few I soon found out that would be unlikely. I made a few calls and fortunately I was able to find replacement tiles in a local salvage yard that were a perfect match. 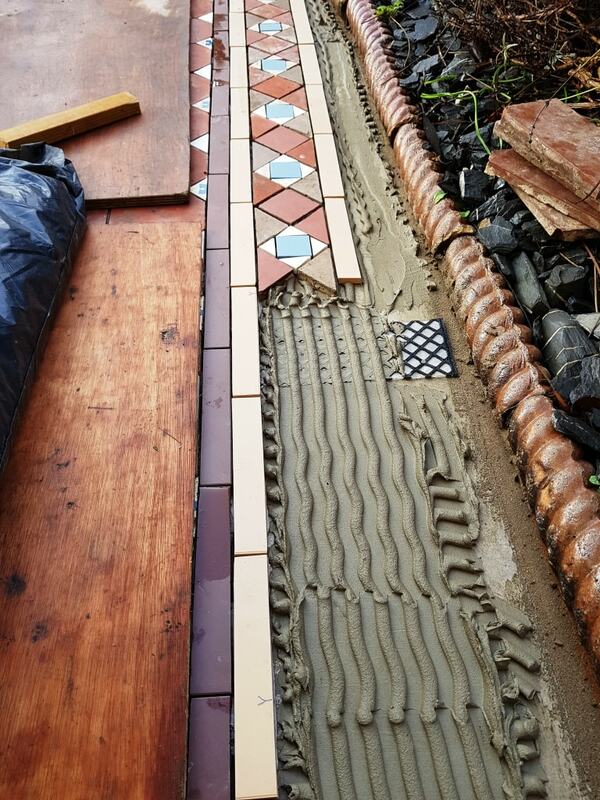 The border tiles were a different matter though, so I had to buy new tiles that could be mixed with old for the border which I purchased from original style. 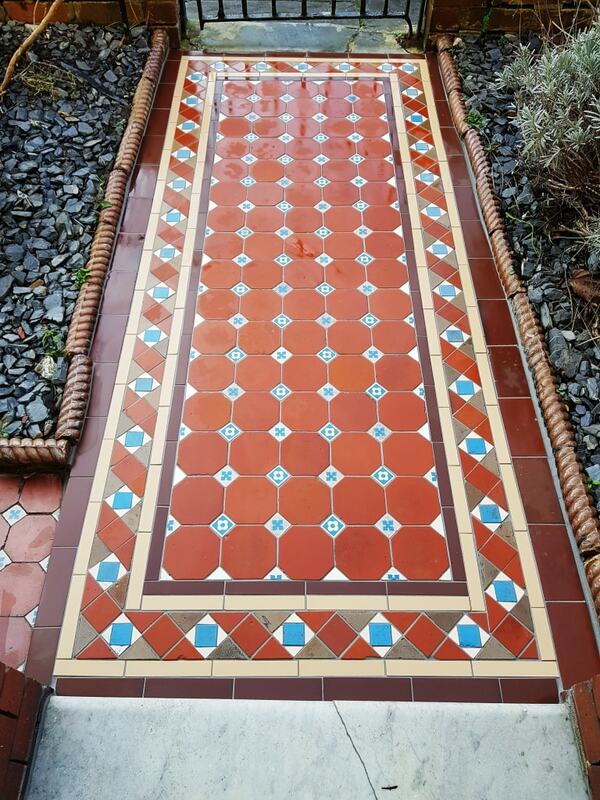 I’ve used Original Style tiles on a few occasions in the past, they have a section dedicated to Victorian Tiles and stock quite a few of the popular patterns and decorative border designs. 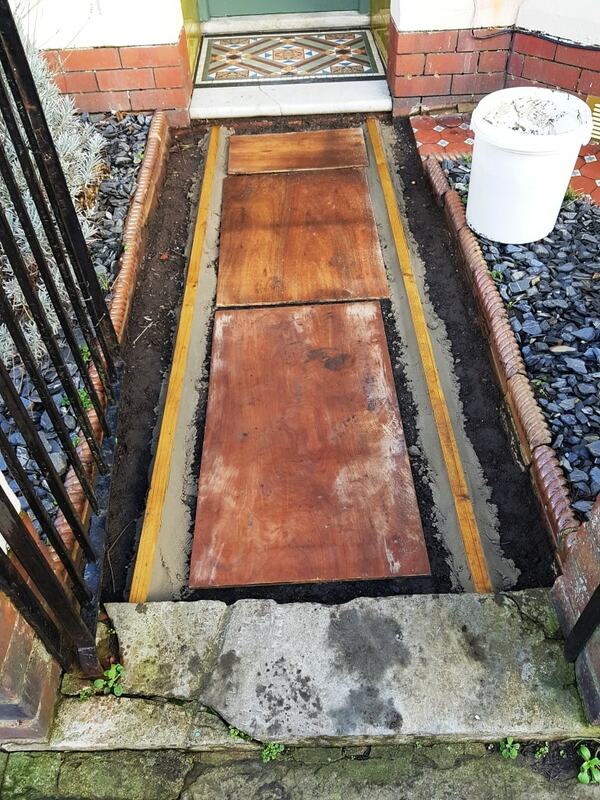 The foundation of the path was cracked and crumbling so after carefully removing as many tiles that were worth saving I rebuilt the base with a new layer of cement. 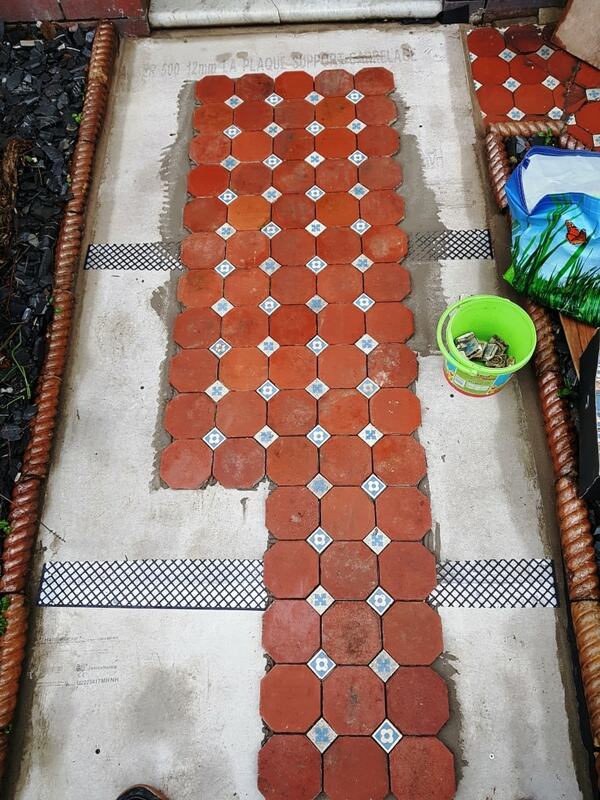 Once the new base was dry I was able to start Tiling as normal, I had taken photographs of the original pattern, so I was able progress quite quickly. Once the central pattern had been laid I progressed onto the edges which took longer to lay due to the complex pattern. Once all the tiles were laid and the adhesive had set I was able to move onto Grouting. Once the tiles were laid and grout had set I was able to move onto cleaning the whole path starting with an acid wash using Tile Doctor Grout Clean-up to remove any grout smears left over from the grouting and also to counter act any salts within the tile which could cause problems later. After a rinse with water the path was then give a good scrub with Tile Doctor Pro-Clean which is a heavy-duty Tile and Grout cleaner that worked well to brings out ingrained dirt. The path was left to dry off overnight and I came back the next day to seal them, I left protection over the path each night after leaving and fortunately we experienced a rare spell of decent weather that week. The sealer I chose was Tile Doctor Colour Grow, it’s fully breathable, which is important when sealing tiles exposed to damp conditions and it’s a colour enhancing sealer which brought out the best in the red quarry tiles as well as giving good protection to the tile surface. My customer was most impressed with the transformation and left the following glowing testimonial on the Tile Doctor feedback system. “Julian was quick to respond to emails. He arrived on the date we arranged and was finished promptly. 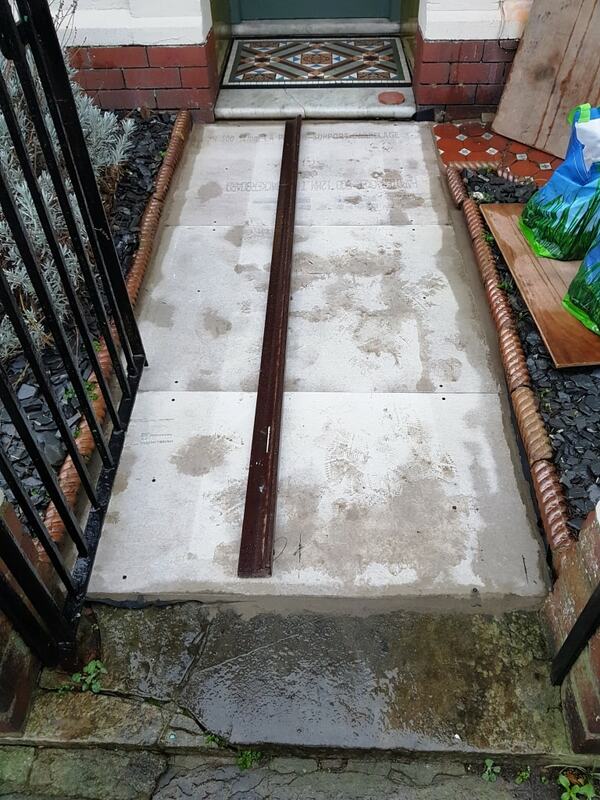 We had our hall tiles re-surfaced and the path completely relayed. Where possible outside Julian re-used the old tiles and when not then used new. The final finish is amazing and definitely gives a wow factor to the entrance to the property. Julian is trustworthy and I would highly recommend him and his work. Thanks for the hard work! 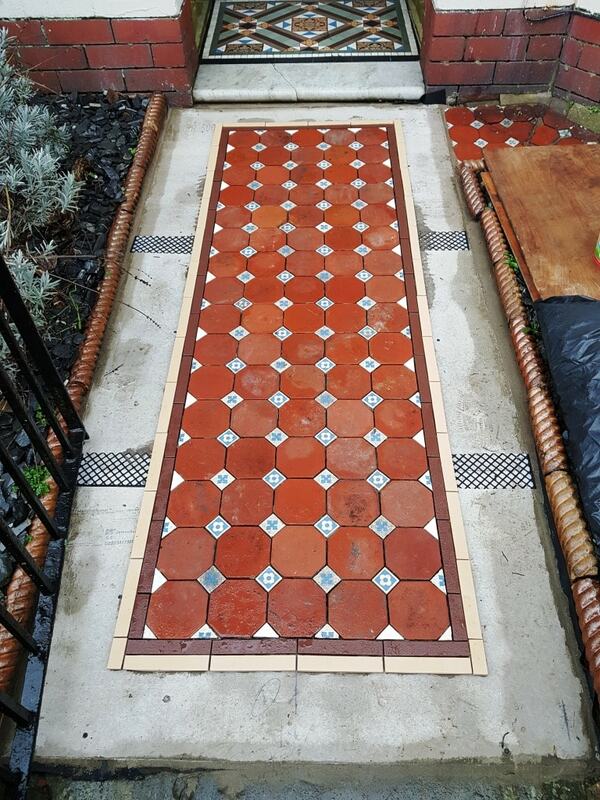 This entry was posted in Cardiff, Front Path, Path Tiling, Pathway Rebuild, period house, South Wales, Tile Cleaning Activities, Tiling Patterns, Victorian Entrance, Victorian Tiled Path, Work History by TileProf. Bookmark the permalink.